I have a background in data mining, applied statistics, and high performance computing, and this toolbox of skills has happily been suited to many different endeavors. In recent years I have published papers and/or embarked on research in epidemiology, biology, physics, applied statistics, criminology, terrorism informatics, and archeoastronomy. Quite a few of my most recent papers have focused on the field of computational epidemiology; in particular computer modelling of influenza pandemics. On this website I share information and computational tools related to my research endeavors, along with many links to helpful documents I have come across on the Internet. I will also be sharing a lot of material related to lectures and seminars I give in statistical and computational methods. Thus many of the posts on this site will have a “lecturing” tone… because they are part of a lecture. The material on this web site isn’t meant to constitute a blog. I hope that readers will find the information I post here useful. Years ago I once had a mentor tell me that one of the hallmarks of a well-written paper is the figures; a reader should be able to read the abstract and introduction, and then, without reading any further, flip to the figures and the figures should provide much of the evidence supporting the hypothesis of the paper. I’ve always kept this in mind in every paper I’ve since produced. In this module, I’ll discuss various things you should focus on in producing good, clear, attractive plots. Once you have used pyephem or an R script to calculate the rise/set azimuths of stars, the Sun and the Moon at a particular date for a particular latitude, you need to correct the calculation for horizon features. If you are looking at an archaeological site that you believe was a comprehensive ancient sky observatory, it may be possible to date the site from its alignments to celestial phenomenon. Note that you need a site with several likely sun/moon/star alignments to do this. On this page I provide some handy R and python scripts to calculate the rise/set azimuth (assuming a flat horizon) of the Sun, Moon, and stars for a given location at a given date. As scientists, our main objective is not just to do well motivated and novel research, but also to publish that research in a timely fashion, and in a way that clearly communicates to an “educated layperson“ what is new and interesting about your research, while also providing enough detail in the paper such that an expert in your field can assess the soundness of your work. Remember that, first and foremost, your work needs to be novel with a well posed research question, and must be an interesting and well motivated addition to the body of published literature on the topic. If you don’t have the skills to produce a well written paper, even with a well posed research question you will have a difficult time getting your work published, and/or you will needlessly get bogged down in review. Sections required in a scientific paper, and what they should contain. Most journals in the field of mathematical epidemiology/biology require that you submit manuscripts in LaTeX format. LaTeX is a word processing language, in which you create a document that contains directives to the latex compiler to produce a final document. LaTeX provides many capabilities not available in Word; perhaps most important to mathematicians, LaTeX enables typesetting of complex equations that would be difficult, if not impossible in Word. In addition, LaTeX has a reference management package called BibTeX that easily enables citation of references within your document. In this module, we will discuss some simple examples of document formatting in LaTeX, and describe how to include figures and tables in the document, and cite references. There have been 8 apparent influenza pandemics (generally agreed upon in the literature to have occurred) since 1700, and a total of 16 apparent and potential pandemics. 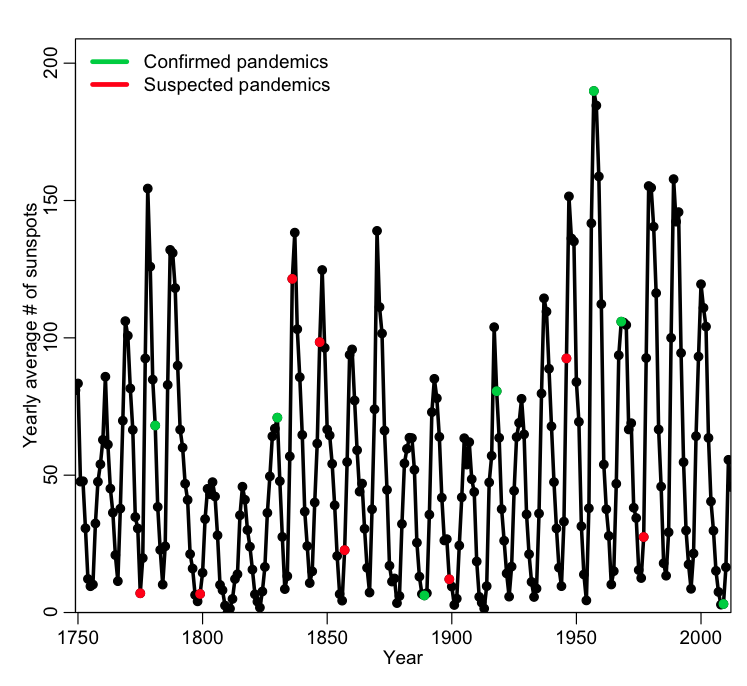 Influenza pandemics tend to have high mortality, which means that it would be awfully nice if we could predict when they will occur, such that we can prepare in advance. A total of 6 out of 8 (or 13 out of 16) perhaps seems like an awfully large fraction that occur near a high or low in sunspot activity! 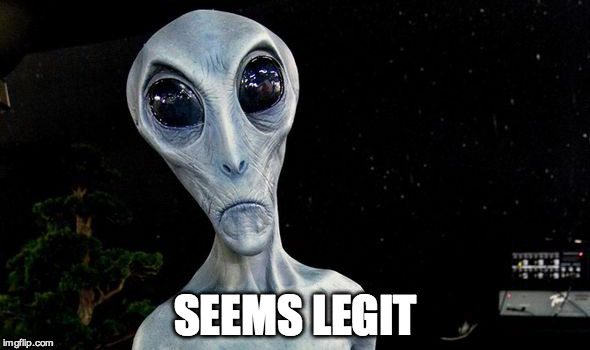 Indeed, there have been claims that sunspot activity can increase the chance of meteorites from outer space bringing in extraterrestrial influenza viruses (no, I’m not making that up… a 1990 paper claiming that actually appeared in Nature). Since that initial paper, there have been several other analyses of the same data, some of which also conclude that yes, influenza pandemics appear to happen “around the time” of sunspot activity maxima and/or minima. However, let’s take a closer look. There were 56 sunspot extrema in the past 264 years. The number of years within +/- one year of an extrema is thus 56*3=168. Thus, by mere random chance, we would expect that the a pandemic would fall “near” a max or min with probability p=168/264=0.64. The observed fraction of 0.75 (or 0.81 if you include potential pandemics too) is higher than this. But is it significantly higher? In R, the binom.test(k,n,p) function returns the confidence interval on the estimate of the probability of success if we observe k successes out of n trials. It also assesses the probability that this fraction is consistent with an assumed true probability of success, p (if the true value of p lies within the estimated confidence interval for the probability of success, there is no statistically significant evidence that they are different). In addition to this simple Binomial probability analysis, I also took a look at the distribution of the number of sunspots in pandemic and non-pandemic years using the two sample Kolomogorov-Smirnov test…. there is no statistically significant difference between the distributions. *The reason the various papers draw the opposite conclusion is due to faulty statistical analyses. Just like the old saying “all happy families are alike, but unhappy families are unhappy in their own way”, it is true that all good statistical analyses tend to be a lot alike, but faulty ones are usually faulty in their own unique way. In this case, in general, the various statistical analyses didn’t account properly for the small sample sizes, and/or used statistical tests or methods inappropriate for the data. It is well worth noting that just because something in the published literature made it past review doesn’t mean that it was a sound analysis without flaws. Posted in El Salvador First Congress on Mathematical Modelling, General	| Enter your password to view comments. 2016 Primary Election: which demographics favour which candidates? 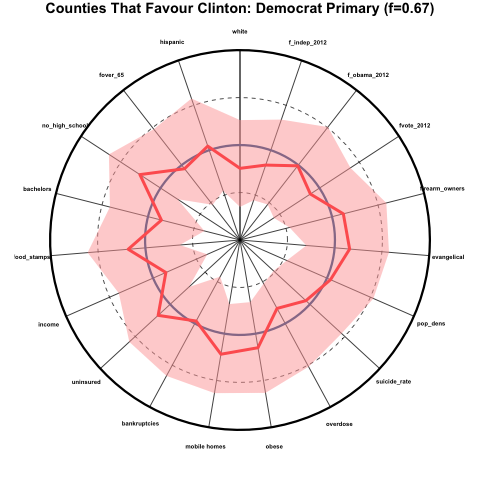 Based on the counties that have had primaries so far at the time of this writing in mid-April, 2016, we expressed the demographics of a particular county as a percentile related to all the other counties that have voted, and visualized the results in a format sometimes called a “spider-web graph”; the spokes of the circular graph correspond to various demographics and social indicators, and if a point lies on a spoke far from the center, it indicates that it lies at a higher percentile for the demographic that corresponds to that spoke. 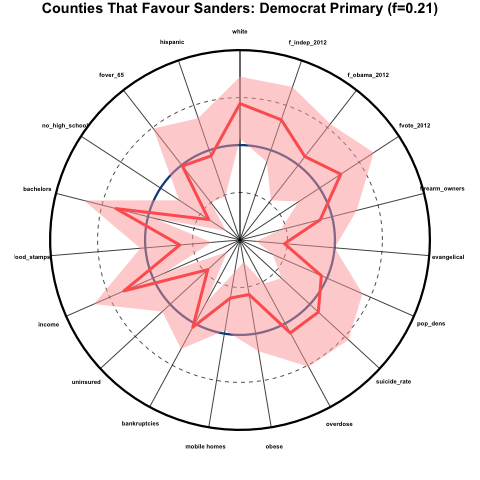 The blue circle on the plot represents the median values for each of the demographics and variables for all counties that have voted in the primaries so far. The outer black circle represents the 100th percentile (basically, the county that has the highest value of that particular indicator along a spoke). The inner dashed line is the 25th percentile, and the outer dashed line is the 75th percentile. 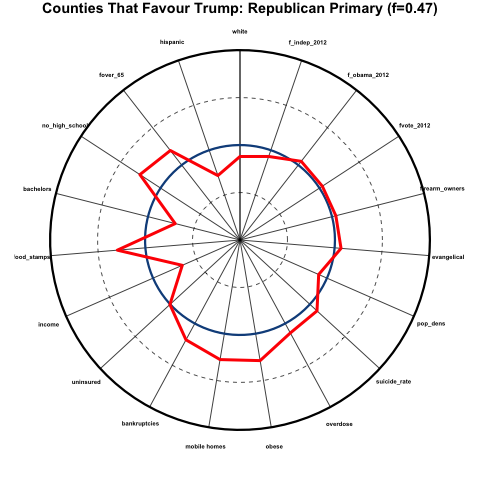 Now, for a particular sub-group of counties (in the case in the figure, counties that favoured Trump over any other candidate by at least 5 points in the primary), we can show, with the red line, how the demographics in those counties compare to those of all other counties. 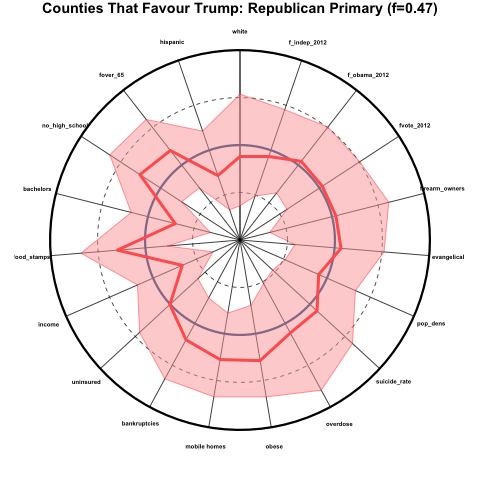 You can see that, for example, the average median household income in counties that favoured Trump is much lower than that for all counties, because the red line dips sharply towards the center of the circle along the “income” spoke. And there is an unusually large fraction of people in those counties who do not have a high school diploma, because the red line deviates outwards along the “no_high_school” spoke. The counties that favour Trump over other candidates skew older and less hispanic, are more poorly educated, have a high fraction of families receiving food stamps, low income, a relatively large fraction of people living in mobile homes, and are generally in poorer health than average. These counties were about average in voter participation, the percentage that voted for Obama in 2012, and the percentage that voted for an independent presidential candidate in 2012. These counties skew far more hispanic, more white, somewhat younger, higher income, and generally have better health than average, despite the very high average of people without health insurance. The counties also skew very rural (low population density), had generally very low voter participation in 2012, and skewed very Republican in the 2012 election. These counties skew very white, very educated, much less evangelical, high income, low percentage of uninsured, and good health (except for overdose and suicide rates, which are about average). There was a high degree of voter participation in these counties in 2012, and they skewed Democrat and heavily Independent rather than Republican. These counties skew perhaps somewhat less white than average, but for the most part are quite close the average for all other counties. Which candidate has the broadest appeal? As I discussed above, the candidate with the broadest appeal would be favoured by counties that are representative of the national averages in the various demographics. 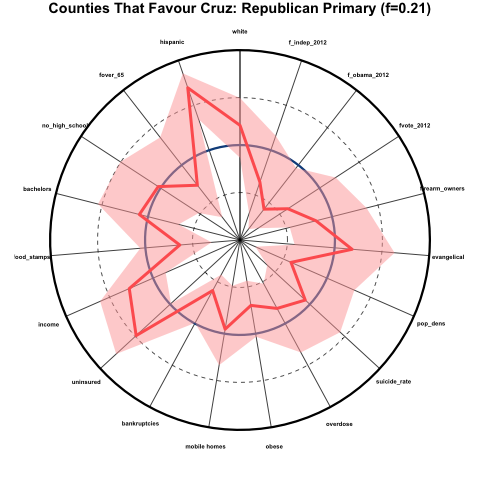 It would appear that, as of mid-April 2016, neither Trump nor Cruz achieves this, although Trump so far comes closer than Cruz to broader appeal; however Trump support appears to skew poorer, unhealthier, and less educated, and Cruz support appears to skew heavily rural, and evangelical. Clinton appears to so far have far broader appeal over a wide array of demographics than Sanders (and indeed, over any other candidate). The Politico website makes available the county level election results for most of the primaries that have taken place. They are missing the county level results for Iowa and Alaska, and Kansas and Minnesota have results by district, not counties. All cause and cardiovascular death rates from 2010 to 2014 from the CDC. Household firearm ownership is estimated using the fraction of suicides that are committed by firearm; the suicide data by cause from 2010 to 2014 is obtained from the CDC. Education, racial and age demographics, household living arrangements, percentage without health insurance, and income are obtained from the 2014 Census Bureau American Community Survey 5 year averages. Land area of counties obtained from the 2015 Census Bureau Gazetteer files. Drug overdose mortality from 1999 to 2014 from the CDC. Obesity and diabetes prevalence from the CDC.